BlackMax™ is a tape wrap specifically designed for high temperature and heat resistance under-hood. Used for performance auto, motorcycle and marine exhaust systems. Provides an insulation layer to keep exhaust gases in the header and exhaust pipes hot, lowering their density and making it easier to exhaust with less back pressure. 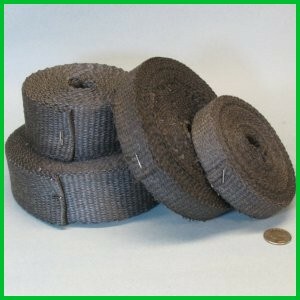 Available in 25 and 50 foot rolls, and in 1 inch and 2 inch widths This high temperature, heat and flame resistant thermal insulating vermiculite coated fiberglass tape will withstand temperatures of 1500°F / 815°C continuous exposure. The base fiberglass is fabricated from high quality type E fiberglass that will not burn, and the vermiculite coating adds added temperature performance and abrasion resistance. This material resists most acids and alkalis and is unaffected by most bleaches and solvents. It is highly flexible and conformable.